Like an easy drive on a Sunday afternoon, the Houston Texans took apart the Cleveland Browns with what seemed little effort Sunday, setting a franchise record for rushing in a game in an easy 30-12 win. The result puts the Browns at 3-5 on the year, and things all week seemed to be pointing to this result. From the poor outing in San Fran last Sunday, to the Peyton Hillis saga leading to him being out with a hammy injury, this result should not come as much of a surprise. What could be classified as a shock was the Texans success on the ground. As of the mid-way point of the fourth quarter, the Texans were putting up about 10 yards per carry. Between the three of Arian Foster, Ben Tate, and then mop up time from Derek Ward, the team ran for 261 yards on 40 carries, an average of 6.5 yards per carry. Both Arian Foster (124) and Ben Tate (115) went over 100 yards on the ground, and the team held the ball for 35:15 to 24:45 for the Browns. – a yawner 30-12 win at Reliant Stadium to move the Texans to 6-3 on the season, and it drops the Browns to 3-5. The game seemed over 8 minutes in when the Texans went up 14-0 after a pair of rushing touchdowns, one by Ben Tate and the other by QB Matt Schaub. The Texans dominated it so thoroughly, they set a franchise record for rushing yards in a game with 261 yards on 40 carries, an average of 6.5 yards per carry. Both Foster (124) and Tate (115) went over 100 yards on the ground, and the team held the ball for 35:15 to 24:45 for the Browns. Houston took the opening kickoff and went 82 yards in 9 plays in what seemed with ease. The 5:10 drive was highlighted by a Schaub 22-yard pass to tight end Joel Dreessen on the second play of the drive. Tate wrapped it up with a 27-yard TD run that saw him go nearly untouched for the score to make it 7-0. Former Texans practice squad running back Chris Ogbonnaya gave the Texans the ball back on Cleveland’s first offensive play, as he fumbled and J.J. Watt recovered it at the Cleveland 28. Six plays later from third-and-goal from the two, Schaub looked to throw before scooting in for the score to put Houston up by two touchdowns. 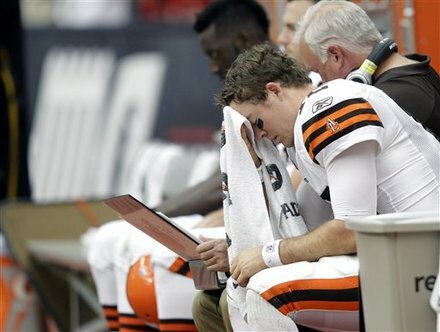 The Texans defense made it a long half for former Texas QB and now Browns signal caller Colt McCoy. He was hit on a number of occasions, and at the end of the half threw a bad pick to Quinten Demps, who took it back 42 yards to set up a Neil Rackers 28-yard field goal to end the half at 24-3. The second half the Texans for the most part put it in cruise control. They got two more Rackers field goals, one from 21 yards out on their first second half drive, and the other from 50 yards out with 10:35 to play. Schaub was 14-for-23 for 119 yards with no TD’s and one pick. He was not sacked on the day. McCoy was beat up all day by the Texans, and was sacked four times. He wrapped up the day 14-for-22 for 146 yards with a late TD to Josh Cribbs in garbage time and a pick. The Texans outgained the Browns 380 to 172, and had 21 first downs to 10 for Cleveland. The Browns offense did little, and without Hillis or even Montario Hardesty, it was a long day for the run game. They put up just 44 yards on 21 carries on the ground, and their leading receiver was Cribbs with 5 grabs for 50 yards. Once again, there was little to write home about, as the O-line didn’t do much to protect McCoy, who was hurried and beat up by the time it was all said and done. Next week the Browns are back at home for the St.Louis Rams at 1pm. Well, I’ve officially lost interest. Decisions this team has made came back to haunt them. Vickers still looks pretty good to me. If you aren’t going to show up, please tell us ahead of time so we can plan accordingly. This season is fast becoming a train wreck – and Shurmer does not seem to have the answers. I’m not sure he knows the questions. So, another lost year in Cleveland, while Cincy has won its fifth straight. We’re back to hearing things like gut check time and turning point – at the season’s midpoint, for cryin’ out loud. I feel sorry for folks like Grossi, Cabot, Canucci, I mean,making a living following sports is already pretty fluff. Imagine having to endure this as a steady diet – for a living. We can just turn it off and move on, but they gotta face thistomorrow and the day after and the day after. It looks like Cleveland has truly become the place where players go to die . . . It all cmes down to an owner who cares enough not to tollerate what the Browns call football. Marecic was an outstanding draft pick…NOT…Marecic-Vickers? Enough said there. So much for our vaunted defense, not one but TWO players rushing for 100+ yards, at this rate Haden won’t be able to wait to get out of Cleveland when his contract is up. Shurmur looks lost, McCoy is getting beaten to a pulp and has NOONE to throw to. Wait, how long did we resign Moore to the team, oh thats right, he couldn’t catch the ball. Until Randy Lerner sells the team to someone that cares about football we are doomed for this, whatever they decide to call it, because I refuse to call it football, it is an insult to the fans and to the former players who played for a once great team.